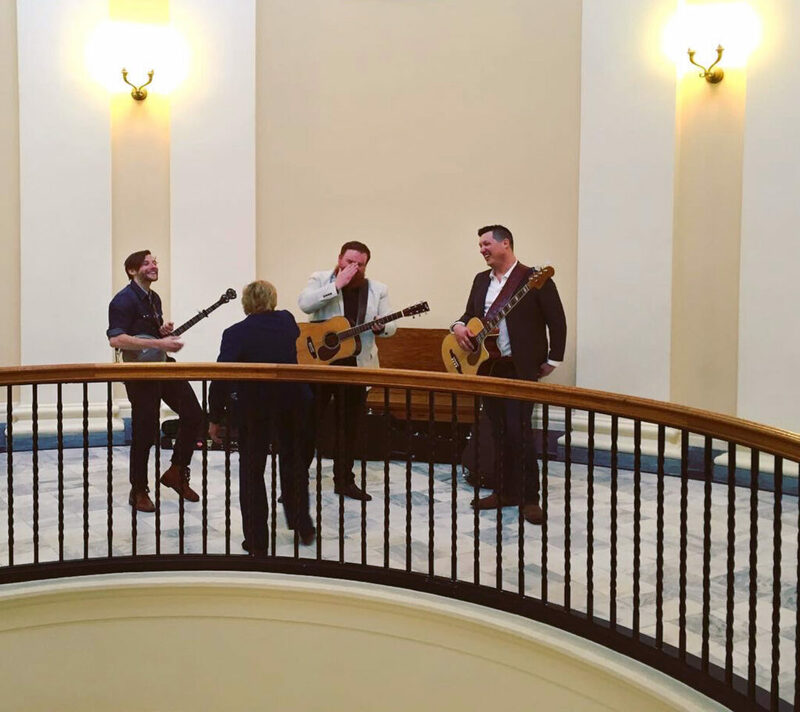 A freshman legislator from Winterport thinks Maine’s praises should be sung, literally, so he’s proposing that a Portland band’s song about the state’s most famous Civil War soldiers be declared the official state ballad. Rep. Scott Cuddy, a Democrat, has filed a bill proposing that the song “The Ballad of the 20th Maine” by The Ghost of Paul Revere be declared the state’s official ballad. Cuddy and other supporters of the idea say granting such recognition to a song about Maine soldiers’ heroic and pivotal role at the Battle of Gettysburg would promote the state’s history as it approaches its bicentennial in 2020. And because the band is current – all members are in their early 30s – it could also get young people and music fans a little more interested in state government. But the idea of declaring an official state anything is tricky, since there are no rules governing how many the state can have or what types. Maine already has an official song, “The State of Maine Song” by Roger Vinton Snow of Portland, which was written in the early 1930s in response to a Maine Publicity Bureau contest but is not widely known today. And it has an official state march, “The Dirigo March,” written by Leo Pepin of Augusta and approved by the Legislature in 2012. Already this year, the Legislature’s Committee on State and Local Government has rejected two bills connected to official state symbols. One bill would have defined specifically which species of chickadee the state’s official bird should be. The other would have changed the state flag to a 1901 design. Cuddy’s bill on the state ballad was officially recorded by the clerk of the House on Thursday and was referred to the State and Local Government Committee, which will schedule a public hearing on it. As of Thursday, no hearings or work sessions had been scheduled on the bill, L.D. 1541. A member of the committee, Rep. William Tuell, R-East Machias, said in an email that he has mixed feelings about the ballad bill. He’s talked to friends who support it and see it as a great way of highlighting Maine history, and he’s a strong supporter of honoring people who served in the military. But he wonders if the Legislature, and the public, are growing tired of proposals to create new state symbols, songs or desserts at a time when there are other pressing problems to deal with. According to the Maine statutes on “seal, motto, emblems and flags,” Maine has 28 officially designated things, including a state crustacean (Maine lobster, approved in 2015), a state fossil (Pertica quadrifaria, 1985), a state treat (whoopie pie, 2011), a state dessert (blueberry pie, 2011) as well as a state soil type (Chesuncook soil series), herb (wintergreen) and sweetener (Maine maple syrup). 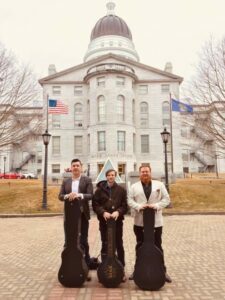 The Ghost of Paul Revere is a folk band, playing acoustic string instruments, formed by three friends who grew up together in the southern Maine towns of Buxton and Hollis. The band has been together for about eight years and performs often in Maine, as well as on tour around the country, and last year appeared on the late-night TV show “Conan” with Conan O’Brien. Though their sound has an old-time folk element, their lyrics are mostly about the contemporary world. About six years ago, band member Griffin Sherry wrote “The Ballad of the 20th Maine” because he’s a big history buff and has a keen interest in the 20th Maine. The regiment has been celebrated in books and film as crucial to the Union’s victory at Gettysburg in 1863, a battle that helped turn the tide of the war in the North’s favor. Sherry said his interest began at Bonny Eagle Middle School, where teacher Mark Andreasen annually gathered students for a re-enactment of the battle at Gettysburg. Sherry, 31, spent about two years researching and writing the song, on which he also sings lead. He said he decided against writing about the 20th Maine’s commanding officer, Joshua Chamberlain, who is a well-known figure and was portrayed by Jeff Daniels in the 1993 film “Gettysburg.” Sherry wanted the ballad to be from the perspective of someone else, a lesser-known Maine foot soldier. So he wrote it in the voice of Andrew Tozier, a flag bearer for the 20th Maine. Tozier had grown up in Plymouth, ran away to work on ships as a youngster, then returned to Maine and enlisted when the Civil War broke out, according to Maine State Archivist Dave Cheever. He was wounded early in the war, losing a finger, and was later shot in the ankle, the lead bullets never removed. He was captured and spent time in Confederate prison camps, Cheever said, before being part of a prisoner swap. Tozier joined the 20th Maine and was assigned to hold the flag at Gettysburg. Flags were a crucial means of communication in the armies of 1863, letting commanders and soldiers know where the troops were, what ground was held and what ground was lost, Cheever said. Soldiers often aimed fire at flag bearers, since taking down a flag could cause confusion among enemy forces. During the Gettysburg battle, Tozier was holding the flag at the top of Little Round Top, as Maine soldiers fought to hold off Confederate troops on lower ground. The soldier assigned to guard Tozier as he held the flag was shot early in the battle and handed his gun to Tozier. With the flagpole tucked under his arm, Tozier loaded and fired the gun down at the Confederates. Chamberlain took note of Tozier’s double duty and knew his troops still held the top of the hill. Later, Chamberlain gave the famous order that caused the Maine troops to charge down the hill and turn the tide of battle. Tozier was later awarded a Medal of Honor, on Chamberlain’s recommendation, Cheever said. He came back to Maine after the war, suffered lifelong headaches from a later battle wound (a bullet that grazed his head), lived with Chamberlain for a time and eventually owned a farm in Litchfield. “Tozier had an incredible story and it really made me want to write about him,” Sherry said. The song is on the band’s 2015 album “Field Notes, Vol. 1” and The Ghost of Paul Revere has played “The Ballad of the 20th Maine” at live shows for years, including in the South, where people seem to really like it, Sherry said. “It gets requested a lot in the South. There’s a lot of history buffs down there,” he said. Fans put the idea of getting some state recognition for the ballad into band members’ heads. But the idea was put into action by Amy Regan Gallant, a longtime friend of the band members who works as a lobbyist for AARP in Maine. Gallant mentioned the idea of a ballad bill to legislators, and Cuddy decided he’d like to sponsor it. Sherry and the other members of the band – Sean McCarthy and Max Davis – went to the State House last week to meet with legislators. They performed the song, along with a few others, in the rotunda, where Gov. Janet Mills stopped by to dance.